Parrotlets are not young parrots, rather small ones. Parrotlets have the same disposition as larger parrots, making the birds territorial, with a tendency to bond well with their owners but not with other birds. Budgies (also known as parakeets) are less territorial in nature and also bond well with their owners as well as other budgies. 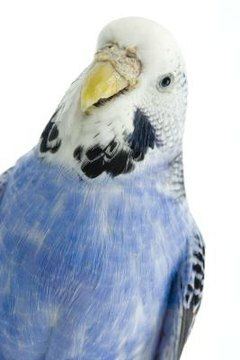 Parrotlets and budgies are similar in size, around 5 to 8 inches from beak to tail. Forpus coelestis, or Pacific parrotlets, are the type most commonly kept as pets. These little parrots average around 4 to 8 inches in length, and can live from 20 to 25 years in captivity. They do best in individual cages. Parrotlets are territorial and consider their cages home. Males fight over territory and even fight females if not given enough space. These birds require a cage that is at least 18 inches high, wide and long. Budgies have a life-span similar to that of parrotlets, surviving around 21 years. Budgies eat a lot and tend to grab as much food as possible. Parrotlets have a similar appetite, so both types of birds need plenty of food at all times. Because budgies and parrotlets both require a lot of cage space, it is best to house the birds separately whenever possible. They will fight if housed together in a too-small cage. Budgies and parrotlets are both from the parrot family, and they have similar personalities. Both birds are friendly toward humans, and both can bond with people, especially if trained to do so from an early age. However budgies are more likely to get along with other birds, particularly members of their own species. This is because budgies live in large colonies in the wild, while parrotlets lead more isolated lives. Budgies are willing to share their space and their things, but it's not so with the parrotlets, who like to keep to themselves. Sharing is not part of this bird's vocabulary, and cage toys are aggressively protected by parrotlets forced to share space with budgies. Fighting may result. If the two types of parrots are forced to live together in a cage, the budgie will be frightened and continuously stressed, and neither bird will be happy. What Is the Difference Between African Ringneck and Indian Ringneck Parrots?